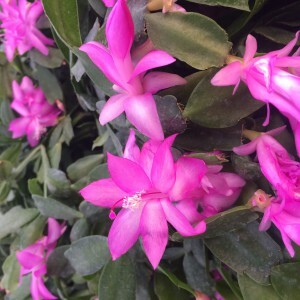 Schlumbergera. It sounds like someone sneezing, yet it is the name of one of the most striking and surreal-looking indoor plants. The Christmas cactus is a small epiphytic (airplant) cactus, that produces a vivid, long lasting colour display of the most exquisite and unusual blooms. 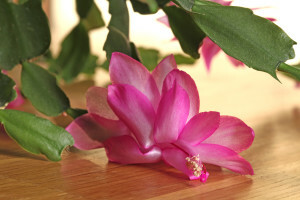 The common name ‘Christmas cactus’, is derived from the flowering time, which in the Northern Hemisphere, is over Christmas. Despite the delicacy of the flowers, these small plants are surprisingly tough. They thrive both indoors and out – filling dull corners and requiring very little attention and care. The annual colour display typically results in them being moved into a premium display spot, where they will receive endless sighs and comments whilst in bloom. The plant itself is most unusual and is sometimes also referred to as ‘The Crab Plant’. A quick glance at the plant and you’ll see why this name is so apt – the leaves are thick, squat and round, consisting of segments that radiate from the plant centre. When in flower, the blooms look exactly like the extension of a crab’s claw! The Christmas cactus (scientifically called Schlumbergera truncata or Schlumbergera buckleyi) with their vibrant flowers, will leave a long-lasting impression in any house or office environment. The leaves are thick segments all in a long chain, radiating from the plant’s centre and have the ability to store water in times of drought. Schlumbergera is available in different colours, including white, pink, yellow, orange, red or purple. Light: Bright light conditions, avoid direct sunlight. Water: Keep soil moist, but make sure that your plant does not sit in water, as this will lead to root and stem rot. Temperature and humidity: Ideal temperature would be between 14 and 21*C. Humidity: Moderate. Increase humidity levels by placing a tray of pebbles filled with water beneath the container.